Surely, there must be people out there who haven’t heard of Temple Run, but good luck finding them. The addictive action game, a viral hit on iOS and Android, has such a fervent built-in audience that a sequel, Temple Run 2, hit No. 1 on Apple’s App Store charts within hours of its launch earlier today. While the original game has players running through an infinite series of flat corridors, booby traps and pits, the new one adds hills, curves, ziplines, mine carts and more. 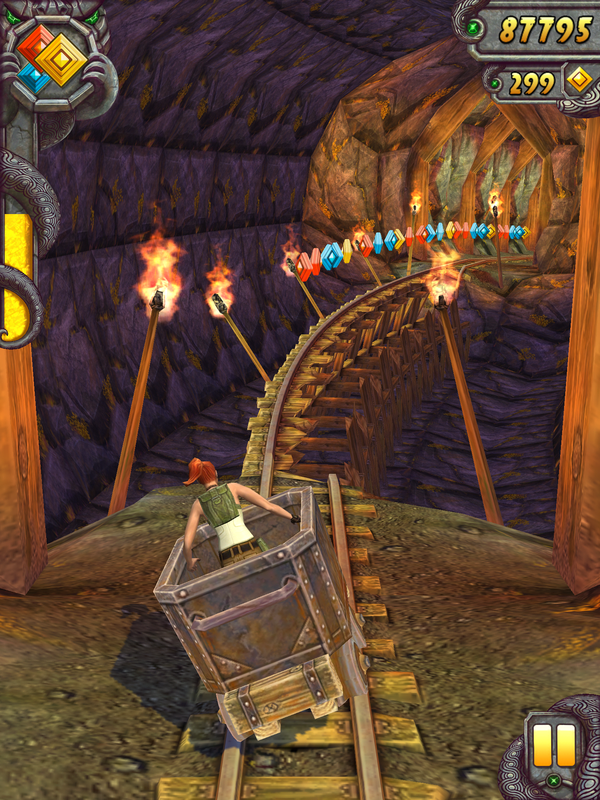 Like its predecessor, though, TR2 is free and supported through in-app purchases. AllThingsD caught up with co-creator Keith Shepherd, who heads up the indie game shop Imangi Studios with his partner and wife, Natalia Luckyanova. AllThingsD: What was the thinking behind a sequel? Why do one? Keith Shepherd: We wound up with all this stuff we wanted to do in Temple Run that we couldn’t physically do as an update to the original. It was just a really small team of us that built the first one (Shepherd, Luckyanova, and artist Kiril Tchangov), and we had no idea that it was going to go on to become this worldwide phenomenon. It wasn’t designed to be ported to other platforms or to be continually added to over the next couple of years. We wanted a fresh start. Since you rebuilt everything from scratch for Temple Run 2, are there mistakes you made with the first game that you had a chance to correct? The first game, we built on our own with our own engine in-house. But we wanted to have a more vibrant, rich environment with curves and hills and better graphics, so we rewrote the game in Unity. Mobile hardware is changing so fast and getting so much more capable that it’s really hard to stay on top of your own engine technology. They’ve got a huge team of people focusing on that. What do you think of the freemium model? If you had known back in 2011 that this would be such a phenomenon, wouldn’t you have wanted to charge 99 cents for it? When we launched it, it started at 99 cents. It didn’t catch on at 99 cents, but it was the same game. I had thought it was always free — my mistake. Most people don’t know that. They think of it as a free game, but that’s how we launched it, because we had never done freemium before. If you’ve spent five months of your life working on something, it’s kind of a scary proposition to put it out there for free. [After we made it free], it snowballed into this viral hit and the in-app purchases way exceeded what we would have made from the paid game. Last year, AllThingsD’s Peter Kafka talked to Igor Pusenjak, the co-creator of Doodle Jump, and he said they’re not working on any other games — just Doodle Jump, because it has performed so well. Are you planning to spend more time on the Temple Run franchise, or is this it for now? You find with success that there’s so much more that fans want from a game. We’re still small, but small means that we can’t run a lot of things in parallel. At some point, we would like to make new games, but right now it’s all just focused on Temple Run. Are you planning to keep Imangi Studios small? The core team for Temple Run 2 was five people (for the new game, Imangi added programmer Jeff Ruediger and artist Pete Parisi from Fuzzy Cube Software). We do want to stay small. Natalia and I made a conscious choice: This is a lifestyle. We really love actually making the games and developing the games, and we feel that if we grew the team a lot and tried to grow the company, we’d wind up doing more things that we’re not as excited about, managing teams and being less involved.